Rachel and Alice are an extremely rare kind of identical twins-so identical that even their aunt and uncle, whom they've lived with since their parents passed away, can't tell them apart. But the sisters are connected in a way that goes well beyond their surfaces: when one experiences pain, the other exhibits the exact same signs of distress. So when one twin mysteriously disappears, the other immediately knows something is wrong-especially when she starts experiencing serious physical traumas, despite the fact that nobody has touched her. 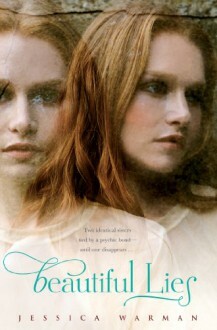 As the search commences to find her sister, the twin left behind must rely on their intense bond to uncover the truth. But is there anyone around her she can trust, when everyone could be a suspect? And ultimately, can she even trust herself? Master storyteller Jessica Warman will keep readers guessing when everything they see-and everything they are told-suddenly becomes unreliable in this page-turning literary thriller. I won a copy through the Goodreads First Reads giveaway.Wow, such a page turner! I could not put this book down. Very glad that I won a copy of this. I'll have to keep an eye out for other books by Jessica Warman. Beautiful Lies is an interesting book with a good premise that does not stand up. I am still confused as to what happened. I thought for a long time that it was about multiple personality disorder but then that didn't pan out. Was one of the twins a ghost? Do I even care? No, I don't.